Breakfast is the most important meal of the day but many people are too busy to really enjoy a nice sit-down meal anymore. If you need something handheld and quick, pass on that processed fast food fare and check out the Breakfast Burrito Maker, the all in one for making a perfect to-go breakfast. This little machine is made for making breakfast burritos which are like normal burritos but made with eggs and sausage instead of steak and rice. 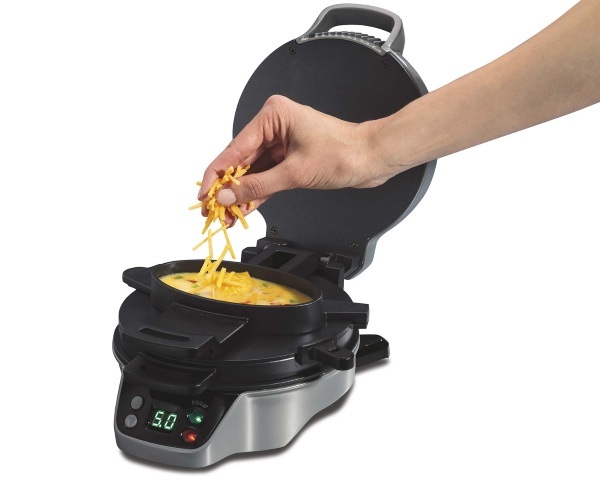 It has layers for your tortilla and your egg based breakfast fillings of choice. It’s ready in five minutes and comes with yummy recipes to make. If scrambled eggs aren’t really your thing, it can also make foodstuffs like stuffed pancakes and crepes which are delicious but probably not as vitamin rich. The downside to this device is that because it’s made for convenience, if you decide to make meat, it has to be precooked but that seems a small price to pay to have a yummy fulfilling breakfast in the morning. The Breakfast Burrito Maker is $44.95.